One of the goals of the Maritime Archaeological Association of New Zealand is to have a means by which objects recovered from the sea can be conserved to halt deterioration. 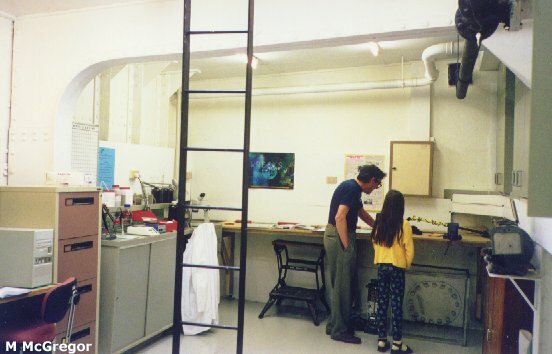 For this reason it was important to establish a conservation laboratory. In May 1997 work commenced to build a lab in the unused starboard midships void space of the historic (then) 71-year-old floating crane Hikitia. (Read about the Lab construction project here.) With the completion of the lab conservation of metal objects began to take place with the first items processed being shipwreck artifacts recovered from the Auckland Islands. The lab works on a volunteer basis and is available to conserve objects for the general public and museums, workload permitting. The lab works on a cost-recovery basis. The lab is also a key resource for the association's education and information program.